Awhile ago I promised a friend that I would bake some cookies, and when asked what kind he liked, oatmeal was at the top of the list. I have a few oatmeal cookie recipes, but my philosophy is you can never have too many. 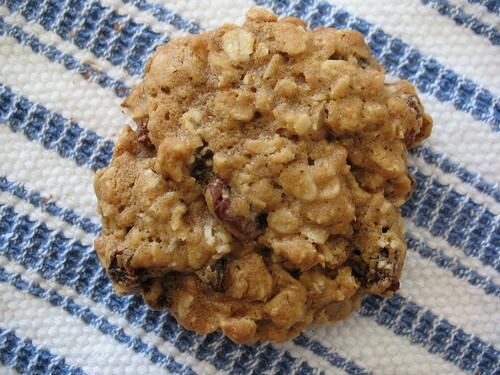 This one is full of rolled oats, raisins, and you allow the dough to cool in the fridge so that when you bake up the cookies, they come out nice and soft and chewy. Did you know this? Cold/cool ingredients means you'll have soft, chewy cookies. Warm ingredients means you'll have crisp cookies. So for all those times that you made cookies and couldn't figure out why the heck they were hard and crunchy vs. soft and chewy, there you go! These babies bake up nice and chewy, perfect for dunking in a glass of milk. I made a batch to send to our friend, and then another batch for myself. I'd try swapping out the raisins for some dried cherries, and add in a bit of nuts if you like. With your electric mixer on medium speed, cream the butter until light and fluffy. Scrape down the bowl and add the brown sugar. Continue to beat until well combined, then add the egg and vanilla. You may need to stop and scrape down the sides of the bowl again to make sure everything is well combined. In a separate bowl, stir together the flour, baking soda, cinnamon, and salt. With your mixer turned on low speed, add it to the flour mixture and let it all come together until it's just combined. Stir in the oats and the raisins. Measure out your cookie dough onto sheets with a tablespoon, placing them about an inch or so apart and flattening them slightly with your hand. Place the cookie sheet in the fridge to chill for awhile-oh, I'd say about 20 minutes. Or you can do what I did, and just cover the dough and chill it for about that long before you scoop it out onto the pans. Bake them for 10-12 minutes at 350 F. The edges will be browned, and the tops just barely set. Let them sit on the pan for a bit before transferring to a wire rack to completely cool.